For the next two days, we are organizing garages. As with organizing paperwork, which we did on Days 19 and 20, this is another task that often takes more than one afternoon to complete. That said, don’t rush and don’t panic if the weather isn’t cooperating: you can come back to this task if needed. Remember, you can find all of the previous missions in the series overview! So, today we’re going to ROCK your garage. Ready? Removing clutter is usually about focusing on the function of a space or room and subtracting everything that doesn’t serve that function. Garages tend to have multiple purposes, though, so the first step is to think about how you really use yours. We’ve discussed “someday stuff” throughout this series — they’re the things we hold onto in the belief that someday we’ll need them. 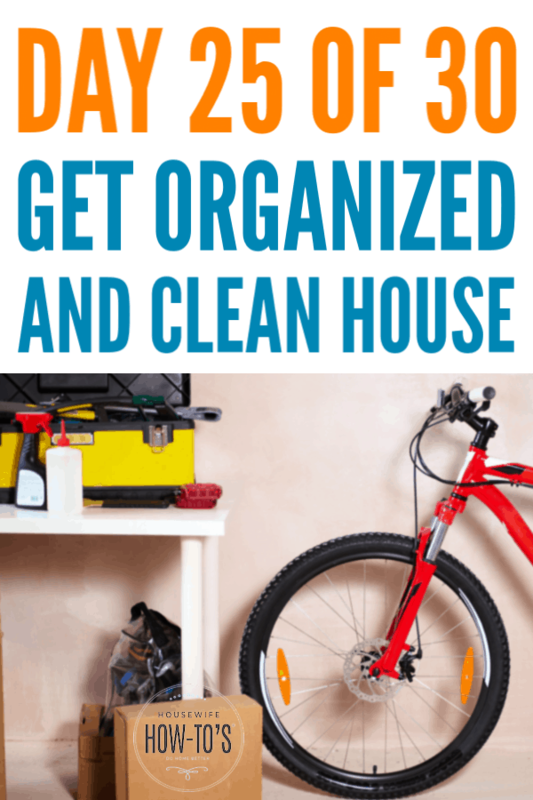 But the more “someday stuff” you hold onto, the more clutter you’re surrounding yourself with, and the less confidence you’ll have in your ability to get and keep an organized, clean home. 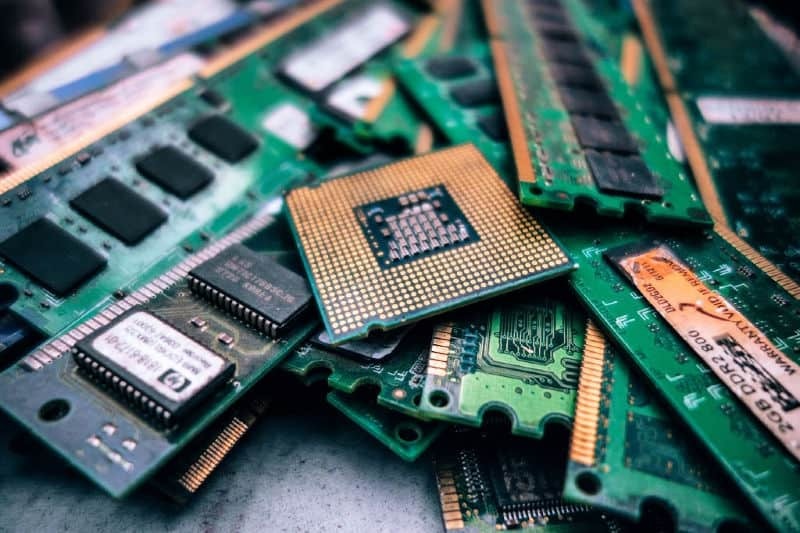 Removing clutter requires acknowledging that such things don’t serve our lives at this point, and we’re burdening ourselves with the obligation of making room for useless stuff. 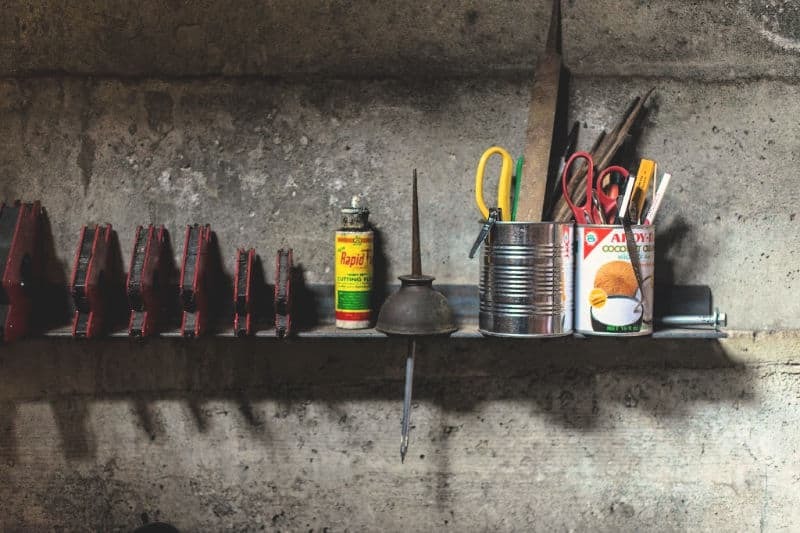 Organizing the garage works best when you keep the various ways you use it in mind and create zones for each. 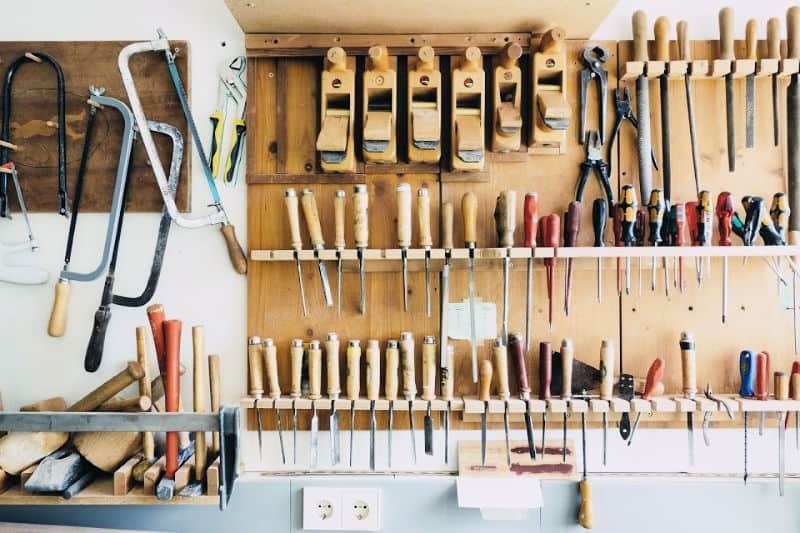 If it’s the place where you or your spouse tinker on or repair things, for example, you’ll want to keep all of your tools together in one spot. Sports equipment would go in another area. 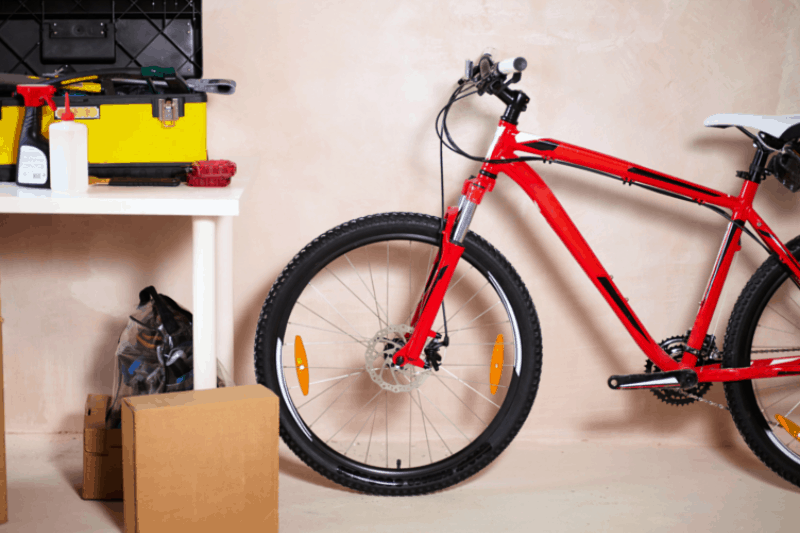 Hang bikes from wall mounts to keep them from taking up floor space or tipping over onto your car. A heavy duty laundry sorter is a great way to store balls, bats, and other equipment. Boxes of old clothes, books, or other keepsakes should be clearly labeled. Clear storage boxes with lids work very well, too. Keep them off of the floor if possible, even if that means laying a piece of plywood over some parallel 2×4″ boards. You’ll be able to clean your garage easier, and your belongings will be protected from flooding. Use vertical space as much as possible. Install shelving, hang gear from the ceiling, mount tool holder racks for yard equipment. Raised storage is particularly crucial with pest control, lawn care, and other household chemicals which should all be kept out of the reach of children and pets. Cleaning the garage is never any fun, but it’s much easier once you’ve removed clutter and organized the rest. If it’s been a while since you performed a garage deep-cleaning, grab a copy of this Garage Spring Cleaning Checklist and roll up your sleeves. Otherwise, give it a basic cleaning today. Keeping things clean that we’ve already rocked is an important part of this 30-day series. By buzzing through our entire home, picking up trash and grabbing things left out of place, we’re breaking the clean/clutter cycle. So, even though organizing garages and cleaning them is a lot of hard, dirty work, be sure you complete the daily cleaning routine. It’ll only take 15-20 minutes if you’ve been following the previous missions, but your home will look freshly cleaned and decluttered once you’re done. Since this is a 2-day task, plan to spend both days working on it. If you finish early, catch up on laundry or take a nice nap. Don’t forget to join our Do Home Better Group on Facebook and show off your progress.